Artistic Director Robert Battle announces a variety of exciting happenings in connection with Alvin Ailey American Dance Theater’s Lincoln Center season at the David H. Koch Theater June 14 – 18. 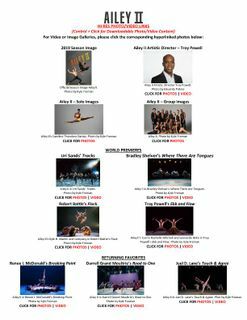 In addition to three diverse programs featuring recent favorites and the company premiere of Battle’s Mass, the season will include an array of uplifting activities for all ages, the return of acclaimed dancer Clifton Brown, a special Ailey Spirit Gala performance of Moonlight x Ailey. 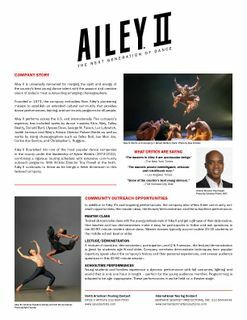 Building on the success of last season's unprecedented world tour to over 45 cities, including performances in France, Germany and the UK, Ailey II is embarking on a 32-city tour including over 20 domestic cities and internationsl stops in Bermuda, Germany and for the first time ever Greece.